Hot off the press! Sony's Gio Corsi has tweeted out this photo taken with Yu Suzuki - accompanied by a copy of the limited edition of Shenmue. The text reads, "Hanging with old friends talking about games! 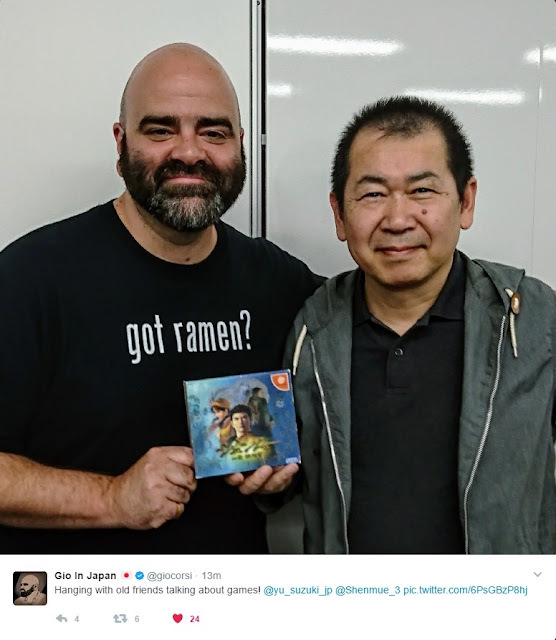 ", and was copied to the official Shenmue 3 twitter account. The photo is taken in front of what looks like office cabinet doors, reflecting fluorescent strip lighting - it would seem a reasonable assumption that Gio was paying a visit to the YS Net development studio. Gio arrived in Tokyo last week and will be in Japan through to the end of this week, for a total of two weeks. With the E3 (Electronic Entertainment Expo) event now less than a month away in Los Angeles, the timing of this visit is unlikely to be coincidental and will fuel the hopes of fans that plans are being formed for Shenmue III to make an appearance in some form at the show - especially as the PSX event last year passed by without mention. Our fingers are firmly crossed! Let us hope it's a #ShenmuE3 for the ages...CAN'T WAIT!!! Not long to wait before all is revealed!